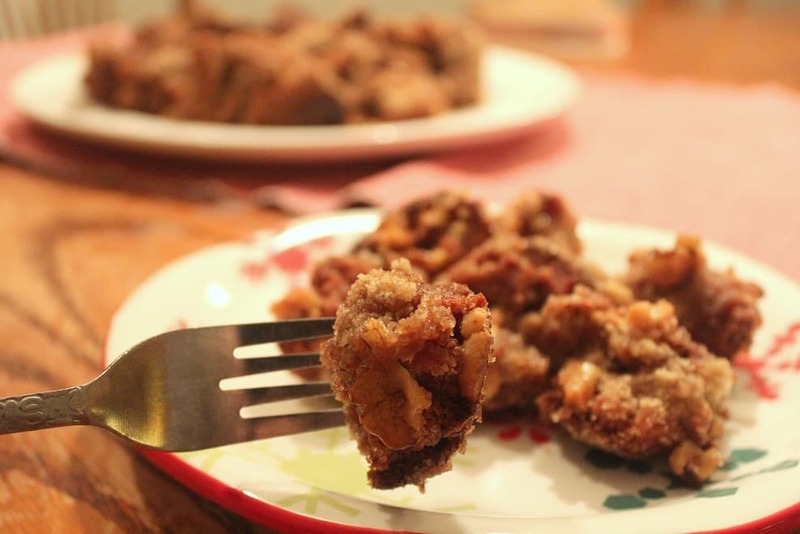 On Day 6 of our Home for the Holidays … Gluten-Free Style event, Stacy at Paleo Parents brings us Paleo(ish) Monkey Bread. You know that wonderful pull-apart bread that is sort of like “ooey gooey” cake, biscuits, and doughnuts all in one. You pull off one or two of the “dough balls” to enjoy and before you know if you’re back pulling off some more! Who knew that it could be made paleo friendly? Well, Stacy has been formulating this recipe for a year and now has it ready for you. Before we move on to today’s giveaway that goes with the recipe in Paleo Parents‘ post, I’d like to give a special shout out to Stacy and Matt–the husband-wife team who constitute Paleo Parents—for their upcoming cookbook, Eat Like a Dinosaur: Recipe and Guidebook for Gluten-Free Kids. Sure it’s geared for children with recipes that include chicken nuggets and cupcakes, but I think there are quite a few of us grown-up “kids” who are looking forward to making these recipes … even the empty-nesters like me! Eat Like a Dinosaur won’t be out until March, but this cookbook is now available for pre-ordering. Place an order and then be delightfully surprised when it shows up in your mailbox in the Spring. Modern Spice: Inspired Indian Flavors for the Contemporary Kitchen and iSPICE App ~ I don’t yet have this Monica Bhide cookbook in my library and as I said yesterday, I don’t have an i”Anything” at this time, so just like Stacyand Matt, I’ll be envious of the reader who wins this combo set as their prize! 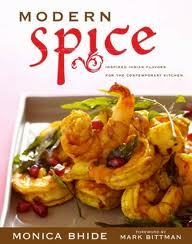 While I don’t have the cookbook or the app, I do follow Monica’s blog, A Life of Spice, religiously. Monica is inspiring in every sense of the word, so I know that her cookbook and app will be pleasers. Here’s one review of Modern Spice from Susan at Food Blogga (including Monica’s Coconut and Tomato Fish Curry). And here’s another review of Modern Spice from Shauna (Gluten-Free Girl). Note that although Modern Spice is not 100% gluten free, most recipes are naturally gluten free and others can easily be adapted. 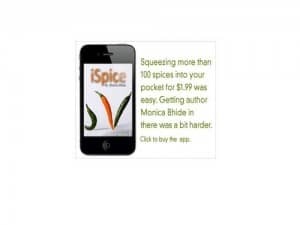 Monica’s iSPICE app seems like a “must have” on the description alone: “This fun and simple application guides you and teaches you about different spices, herbs and seasonings. You will find valuable information on the spice, videos, recipes and of course where to purchase the ingredients.” That’s enough for me, but you can read more here in a recent post on Monica’s blog. 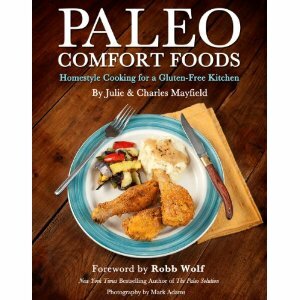 Paleo Comfort Foods ~ I’ve made several recipes so far from this new cookbook by Julie and Charles Mayfield and have truly loved them all! My copy already looks like I’ve owned it for a year, not just a few months. First and foremost is the Basic Bread Loaf. 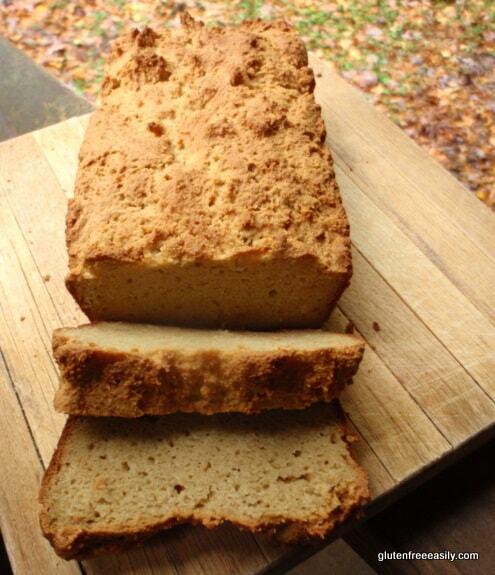 For grain-free eaters, this bread is anything but basic in my opinion. I loved it from the very first time I made it. Gluten-free, mostly grain-free Son loved it. Gluten-full husband loved this bread, too. Hot out of the oven with a spread of butter, he thought it made for a great afternoon snack. I’ve made this super easy, no-fail recipe several times, with the last time being on Thanksgiving. My gluten-full mom took what was left of the loaf with her after our meal. Now that’s saying a lot! I was also inspired to make Proscuitto-Wrapped Asparagus for our holiday meal. I really wanted to make the Prosciutto and Asparagus Bundles, but my grocery store was out of prosciutto, so I only had a small amount of prosciutto in the fridge to work with. Surprisingly, this was the first time most of my family members had eaten prosciutto, but they all loved the prosciutto-wrapped asparagus. Julie’s bundle packaging would have made a much prettier presentation though. Before heading out for camping to our mountain property in mid-October, I mixed up some of Dad’ Dry Rub. 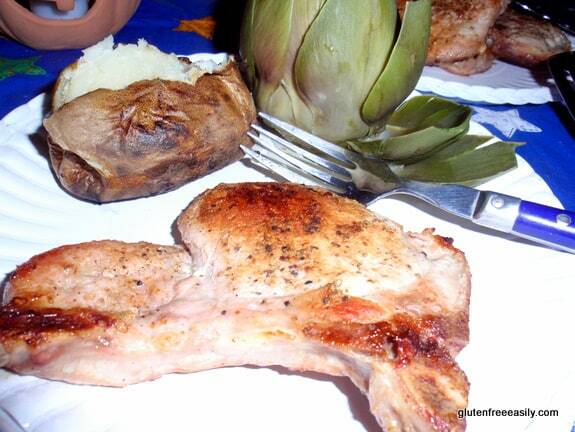 It worked beautifully for grilled pork chops! I also made the Morning Glory Muffins from Paleo Comfort Foods. So good and yet so good for you … always my favorite combination. I skipped the raisins and added some chopped walnuts instead. Fabulous! You can find the recipe here on the Paleo Comfort Foods blog. 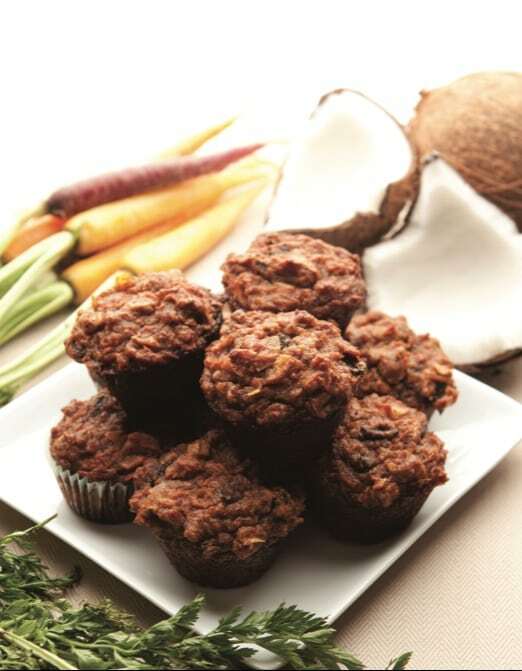 The photo below is one from the Paleo Comfort Foods cookbook. (I took my own pics early in the a.m.; they don’t look nearly as good as this one.) The photos in the book are lovely full-sized photos, with additional smaller photos beneath each recipe. The photos are very appealing, yet “accessible.” They show that anyone can easily make these recipes. My only nitpick with this book was the index. For example, most recipes are listed by recipe title only. So if you want to look up the bread recipe, you’ll see nothing for “bread,” you have to know that it’s called Basic Bread Loaf. Yet there are multiple entries for “pepper” … presumably all the recipes that include pepper. Is the “lacking” index a huge deal? No, but it is a hindrance to easily finding the great recipes in this cookbook. The Table of Contents didn’t provide much more help, but chances are that you’ll have the pages of your favorite recipes bookmarked or dog-eared after just one perusal. But, before I even finished writing this review, lo and behold, Julie and Charles have created a new Table of Contents in a downloadable PDF on their website in response to readers’ comments and requests. I really appreciate authors who respond to their readers! Last, Amazon reviews show Paleo Comfort Foods as a 5-star cookbook and I couldn’t agree more. 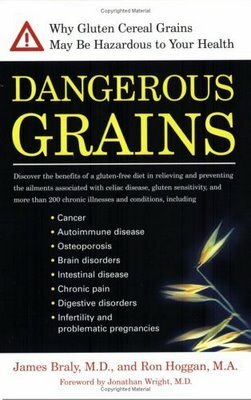 Dangerous Grains: Why Gluten Cereals May Be Dangerous to Your Health ~ Co-authored by Ron Hoggan, Ed.D. and Dr. James Braly, it’s Dr. Hoggan’s passion and research that shines through in this book, which I regard as one of the best for revealing the multitude of conditions and symptoms related to gluten—over 200 are shared. This book was the first one that I read after receiving my gluten intolerance diagnosis 8 years ago. Reading it was my first homework assignment from the doctor who diagnosed me. Today Dangerous Grains is still an eye opener to anyone who reads it. I also suggest that you read the guest post here at gfe from Dr. Hoggan, Top 20 Things You Should Know About Gluten. Visit Paleo Parents at their blog here to check out their Monkey Bread recipe and to enter the giveaway (ending Monday, December 5, midnight EST), which will have three winners. You still have some time to enter Sunny’s (And Love It, Too!) giveaway (Free For All Cooking, The Whole Life Nutrition Cookbook, 100 Best Gluten-Free Recipes, and Cook IT Allergy Free App) … it ends Sunday, December 4th, at 8:00 pm CST. Enter here on Sunny’s blog. Finally, tomorrow, please visit Maggie at She Let Them Eat Cake for another recipe that means “home” and “holidays,” plus a giveaway of one resource book and two cookbooks (one being offered exclusively— pre-release—to our holiday event readers!). 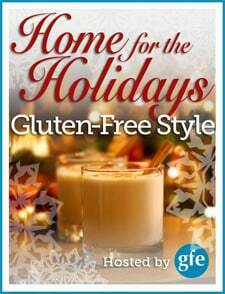 UPDATE: You can find Maggie’s post, which includes Gluten-Free, Dairy-Free Candy Cane Ice Cream and a giveaway of The Gluten-Free Almond Flour Cookbook, The Dairy-Free and Gluten-Free Kitchen (exclusive, pre-release copy for our holiday event! ), and Sugar Nation (valuable, new resource book), here. Oh my gosh, I love the recipes in Paleo Comfort Foods also!! I have a question, and it’s probably going to get buried in the comments over on the giveaway page. I’m going to post it again here. Have you made the mashed cauliflower? I had a small issue– I could not mash them enough to get the texture right. I ended up with a lot of the grainy-small-chunk bits. I haven’t tried to make cauliflower rice, but I think I unintentionally created the rice. The texture was a lot to overcome, and it wasn’t stuck together like mashed potatoes. Do you know how I can make it more “mashey”? Sounds like something my mom used to make-can’t wait to try the gf version!